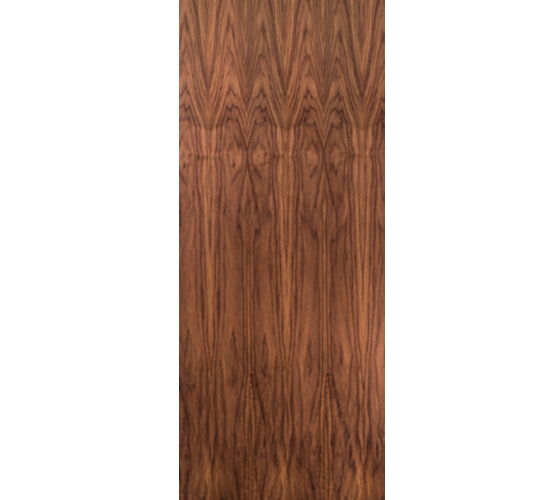 Plain Sliced Walnut door skins are graded according to WDMA IS-1A and AWS Custom Grade Architectural “A” grade wood veneer (minimum thickness 1/50” before sanding). Veneer slicing is done parallel to a line through the center of the log. Cathedral and straight grain patters result. The individual pieces of veneer are kept in the order they are sliced, permitting a natural grain progression when assembled as a door face. Plain Sliced Walnut veneer flitches from Lynden Door are book matched, where every other piece of veneer is turned over so adjacent pages are opened like two adjacent pages in a book. The veneer joints match, creating a mirrored image pattern at the joint line. Available up to 4’ x 10’ with bonded/sanded core assembly – 1 3/8″ and 1 3/4″ with option up to 2 ½” thick. Light sanding recommended prior to finishing. Contact your Lynden Door distributor to source frames and casing.